Getting started with the Social Thinking Curriculum by Michelle Garcia Winner is always a challenge. Most of us, Speech-Language Pathologists, fall under two distinct categories: 1) “Read first Therapists” that like to read and study a program until it we can recite it in our sleep before we will begin to implement it on our students, 2) “Try it out first Therapists” that will try to figure out the program while we implement it on our students. I belong to the former category. I spent months after my first Social Thinking conference buying various books and studying them. 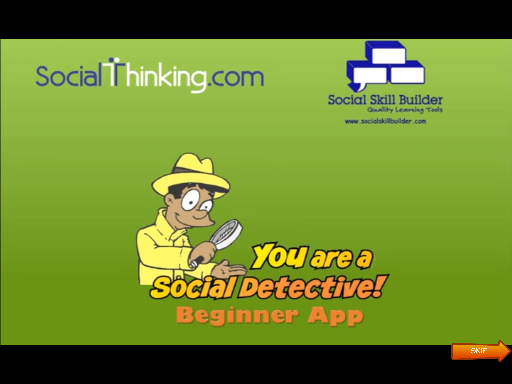 After all that extensive reading, I concluded that, “You are a Social Detective!” was arguably one of the best programs to initiate the Social Thinking curriculum. This is possibly also because a majority of my caseload includes pre-school and early elementary students. 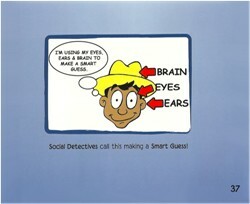 It uses a comic book form and introduces many of the social thinking vocabulary in a clear and systematic way. 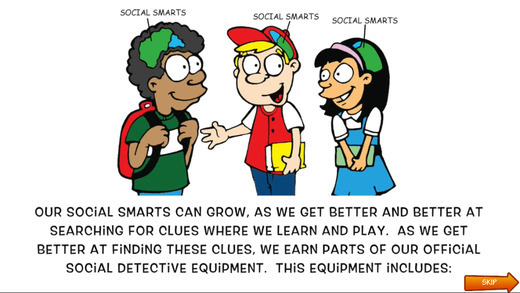 The first section points out how we all have school smarts, sports smarts, Lego smarts, etc. but we also have social smarts. 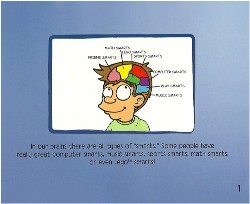 It explains that social smarts means understanding that others have thoughts about us and we have thoughts about others. We use social smarts everywhere. 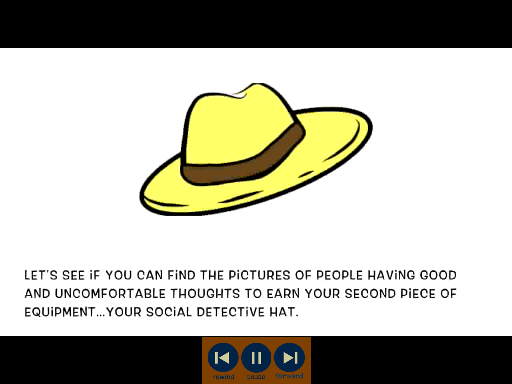 Some of the social thinking vocabulary that is explained using simple but age appropriate illustrations include “being a part of a group,” “thinking with our eyes,” “expected and unexpected behaviors.” The program uses the same social situation to contrast expected and unexpected behaviors, making it easier for children to grasp the concept. The book introduces the concept of “having uncomfortable thoughts,” which, in my opinion is more appropriate and specific than using “feeling mad or angry,” especially for children on the spectrum. Feeling angry is so broad and vague and encompasses so many different scenarios and situations, that it makes it challenging for children on the Autism Spectrum. “Having uncomfortable thoughts” directly links the person’s thoughts to the student’s behavior. 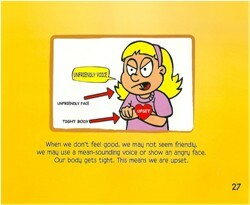 The book also explains “being upset” in explicit physical terms (mean sounding voice, angry face, body gets tight) so children can identify their own states when they get upset. 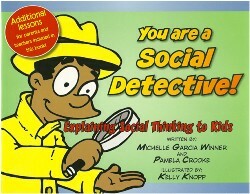 The book then goes on to explain the process of being a social detective, i.e. using eyes and ears along with what they know in their brains. 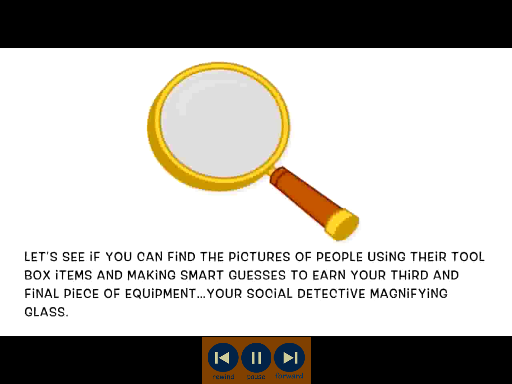 The authors talk about how we use our eyes, ears and brain to make “Smart Guesses” about how to behave. The contrast (Whacky Guess) is also illustrated. 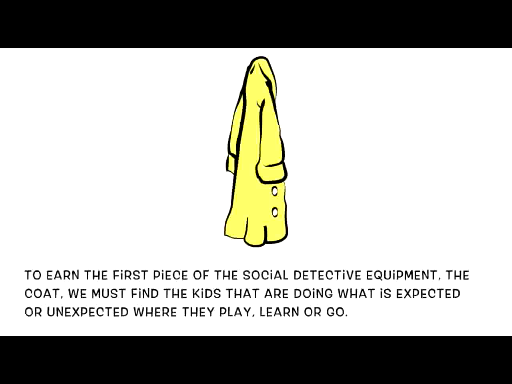 Illustrates in a simple and clear manner what it means to be a social detective. Appropriate for early to late elementary aged students. Contains three lesson plans that require little to no preparation. The illustrations may not be appropriate for older students. Wish it included more lesson plans. Some of the concepts may be challenging for low functioning students. 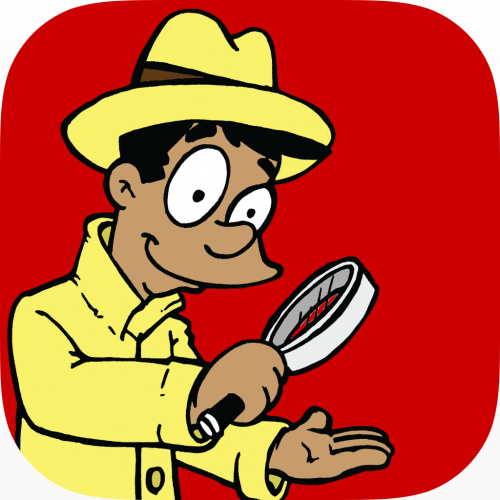 For me, “Being a Social Detective” forms the crux of the Social Thinking curriculum. Unless our students understand that their “unexpected behaviors” cause others to have “uncomfortable thoughts” about them, they are unlikely to change their behaviors. Concrete reinforcers such as prizes will only go so far. When I read Michelle Garcia Winner’s book “Thinking About YOU, Thinking About ME,” it had what I call, “a domino effect.” It seemed like to the doors of Social Thinking had just opened for me and there was a whole new world to discover. During my discovery process I came across Audra Jensen’s book “I Get It!” The book delivers exactly what it promises. It helps both the clinicians and the students understand important Social Thinking concepts that in theory seem abstract and difficult to define, but when used in context of familiar children’s literature, suddenly make sense. I’ve always been a big proponent of using children’s literature in therapy. I use it to build receptive language, vocabulary, grammar or syntax, speech articulation skills and also as a reinforcement. 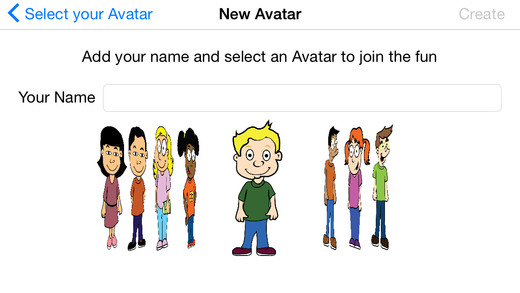 So the idea of using it to teach Social Thinking concepts seemed inevitable to me. Audra Jensen’s book helped put it all together. She addresses the concepts such as “Body in the Group,” “Expected/ Unexpected Behavior,” “Flexible Brain,” “Keeping Brain in the Group,” as well as books that compliment the introduction and instruction of the Superflex curriculum. Superflex is a social skills super-hero (created by Stephanie Madrigal as a part of Michelle Garcia Winner’s Social Thinking curriculum). He battles social villains, called the Unthinkables that disrupt good social behavior. Supplementing the Superflex curriculum with children’s literature allows the child to comprehend the concepts as they relate to familiar characters. 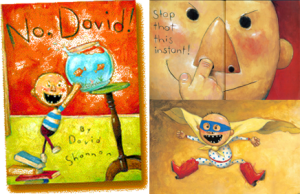 For example, one of the books Audra Jenson recommends to teach “Expected/ Unexpected” behaviors is the very popular book, “No David!” by David Shannon. 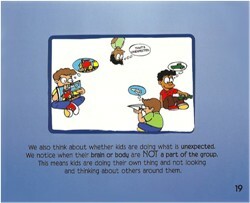 The book has excellent illustrations that make differentiating “expected” and “unexpected” behaviors easy and obvious. Audra also talks about how the book offers opportunities for children to analyze the behaviors and state why they are “unexpected” and what his mother is feeling when David engages in those behaviors. Putting a lesson together to teach the concept of “expected/ unexpected behaviors” using “No David!” would be fairly easy for most experienced clinicians. However, for me, having the resource list of children’s books that teach specific Social Thinking concepts makes Audra Jensen’s book an incredibly handy tool. An additional benefit of using children’s literature as a tool is that lessons can be planned for individual (one-on-one sessions) as well as groups. The area of language disorders that seemed to confound most therapists, including myself, for a long time was social skills or pragmatics. That was until I discovered Michelle Garcia Winner’s work. When I read her book “Thinking About YOU, Thinking About ME,” I finally felt relief. I started thinking about social skills in a completely different way that made sense. I realized that the reason my therapy tools didn’t seem powerful or effective was because I was focusing on teaching specific skills (e.g. How to start a conversation) in a specific situation (e.g. When you meet your neighbor), rather than teaching social thinking or social cognition. As a clinician, when you teach a specific skill in an artificial environment, the student may do well to learn the skill. But the questions “What happens when the situation changes? Can my student generalize this skill to another environment?” always haunted me. The knowledge that you can build a child’s perspective taking ability, or his ability to “listen with his whole body” to help him across situations and contexts, was my Eureka moment. Collectively as service providers for pre-school or early elementary -aged children with social skill deficits, we seem to focus on grammar or vocabulary building. What I quickly realized was that the area of social skills seemed to persist in so many of the little ones I saw. Even when their speech is completely intelligible and the structure of their sentences and vocabulary seems appropriate, some how they continue to have difficulties interacting with peers and adults. It was clear to me that the missing piece of the puzzle was a program that worked on their social thinking skills. 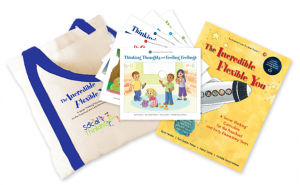 I am therefore very pleased and excited to offer Michelle Garcia Winner’s new program “The Incredible Flexible You,” a social thinking curriculum for preschool and early elementary years. This program uses Michelle Garcia Winner’s social thinking model adapted for ages 4- 7 years using activities and materials that engage and excite the little ones. The program uses books, music and play based activities to target core concepts of social thinking such as Thinking Thoughts, Feeling Feelings, Whole Body Listening, Thinking with Your Eyes, the Group Plan and Body in a Group. The beauty of the program is that it is a simple, kid-friendly and systematic curriculum to teach concepts and vocabulary that are usually challenging for preschool and elementary-aged children. It teaches children to “think social” rather than specific “social skills.” It also includes letters for parents and families to keep them involved in the process to ensure carry-over.